Despite several households in the New York metropolitan area going without power in the aftermath of superstorm Sandy, the Atlantis Cricket Club’s annual awards dinner was electrifying with the powerful presence of former Trinidad & Tobago and West Indies women’s cricket captain, and now assistant women’s cricket coach Stephanie Judith Power. As energetic, but far less destructive than the hurricane that swept through the New York metropolitan area, Stephanie Power arrived amidst the height of the hurricane that claimed over 100 lives and left miles and miles of US coastal destruction. 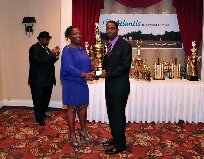 However, with a disarming smile and a genuine humility reserved for deity, Ms. Power was an illuminating presence at the Atlantis Cricket Club – NY 46th anniversary awards dinner held recently at the Adria Hotel & Conference Center in Bayside, NY. Despite the unprecedented storm hitting new York and leaving many without lights, gasoline shortages and a disrupted transportation system, Atlantis, nonetheless forged ahead to honor the Laventille, Trinidad born right-hand batswoman and wicketkeeper, making her an honorary member of the New York based club, and joining such legends as fellow Trinidadian Gus Logie, Clive Lloyd, Lance Gibbs, Andy Roberts, Curtly Ambrose, Alvin Kallicharran, and others. Ms. Power is the first woman to be so honored by the club. She has represented the West Indies in one Test match vs. Pakistan in 2004 and 34 One Day Internationals. She made her ODI debut against the Australia women in 1993 in England. Ms. Power led the West Indies Women’s XI in three ICC Women’s Cricket World Cups (1993, 1997 and 2005), and was appointed assistant coach of the West Indies women’s team in 2009. Trinidad & Tobago’s Ambassador to the USA and that country’s Permanent representative to the Organization of American States Dr. Neil Parsan, in a message said, “It gives me great pleasure to extend heartfelt congratulations on behalf of the Government of the Republic of Trinidad and Tobago to Ms. Stephanie Power on receiving honorary membership to the prestigious Atlantis Cricket Club of New York. There were a significant number of US national players in attendance at the dinner to help Coach Steph celebrate her award. Among those were former US women’s captain Doris Francis, Joan Alexander-Serrano, Samantha Ramautar, Karen Bayles, Melissa Sandy, Joy Jones and several local female players. Although the night belonged to Stephanie Judith Power and the ladies, Atlantis took time out to also honor a former player and now benefactor of the club Dr. Glendon F. Archer, CEO of Metallica Commodities Corporation. Mr. Archer is a former medium pace bowler and middle-order batsman who has been a member of the club for more than 20 years. Now a very successful businessman, he spoke of reaching back to help the less fortunate, remarking that he found such a vehicle in Atlantis; his “Country Club”. Mr. Archer has served in several capacities including President, on Atlantis’ Executive Board over the years, and during his remarks to the dinner guests, quipped, “I know why the club has decided to make me an honorary member. They obviously wanted to retire me from the game.” Metallica is a global commodities company headquartered in White Plains, NY and doing business on five continents. As is customary, Atlantis also used the anniversary celebration to acknowledge the outstanding performances of its players during the just concluded season. The following players received awards, as listed. Nicholas Standford, recently selected to play for the US vs. Canada in the Annual Auty Cup this year in Florida, took home several batting honors and the 2012 MVP award. This entry was posted in Features, News and tagged Atlantlis, John Aaron, Nicholas Stanford, Stephanie Power. Bookmark the permalink.